How can healthy sugar substitutes help you? Feel completely balanced throughout the day? One of the most critical things you can do is to reduce sugar in your diet. Choosing healthy sugar substitutes makes the transition easy. Sugar is a highly refined chemical product. Brown sugar is simply sucrose with the addition of a small amount of molasses. As soon as we eat sugar it depresses our immune system, leaving us more vulnerable to colds and flus. Sugar is very acidifying. A body that is overly acidic is prone to inflammation, illness and disease. Sugar also contributes to the blues by spiking our glycemic levels way up. So... after eating sugar, you’ll experience low energy, fatigue and even depression, which may cause you to reach for more sugar or coffee for a boost. A sugar addiction quickly results. Yes. It’s an addiction, with many similarities to alcoholism. In fact, alcohol is simply fermented sugar! Avoiding sugar can be a challenge. It’s in almost everything. Even some snacks we may consider healthy are often loaded with sugar. A Nature Valley Granola Bar contains the equivalent of three teaspoons of sugar. A small low-fat yogurt with fruit contains the equivalent of 4 ½ teaspoons of added sugar. Ketchup is more than 1/3 sugar. 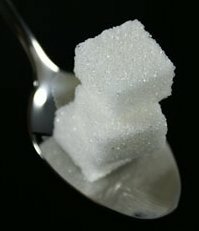 Due to the high sugar content of everyday foods like these, it is predicted that 1/3 of our children will be diabetics. Wouldn’t it be great to find some better snack alternatives for ourselves and for our families? It is especially important to avoid excess sugar when following a diet for diabetes. We can start by replacing the sugar in our diets with better sugar substitute choices. Stevia and Xylitol are two of the best natural sweeteners that have a negligible effect on blood glucose and are readily available in health food stores. Stevia extracts, from the leaf of the Stevia plant, have up to 300 times the sweetness of sugar. This remarkable herb originating from Paraguay is noncaloric. Stevia comes in liquid or powder form. Check the label, as some companies add maltodextrin or other fillers to the powder form. It is best to find it in its pure form. Although the name Xylitol sounds like a chemical, it is another excellent natural sugar substitute derived from birch tree bark or corn cobs. Xylitol can substitute for sugar in equal amounts. I’m sure if you filled up your sugar bowl with Xylitol no one would ever know! A few teaspoons are fine, but eating a large amount of xylitol can result in diarrhea. As with many sweeteners, Xylitol is toxic for dogs, so keep it and food made with it away from your pet. It is a little difficult to give exact equivalents for Stevia as everyone has their personal preference for how sweet they like their food. In general replace 1 cup of sugar with 1 teaspoon liquid or powder Stevia, and 1 teaspoon of sugar with a pinch of Stevia powder or 2 to 4 drops of liquid Stevia. Start with small amounts. 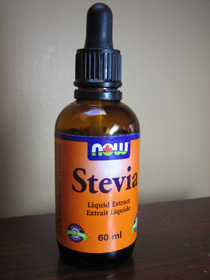 If you use too much liquid Stevia it will be overly sweet and have a bitter after taste. You will have to adjust cake recipes as they won’t rise as easily, but it is easy to use Stevia or Xylitol to sweeten plain yogurt, add to hot beverages, make homemade puddings, cookies, etc. The goal is to start by replacing sugar with healthier alternatives in order to work towards reducing our intake of sweets over all. Improving your Diet is the first step in making life sweet!